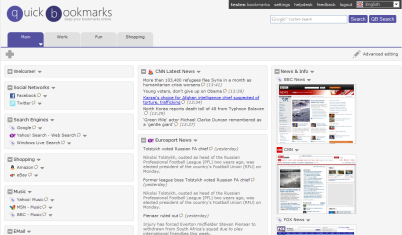 Quick Bookmarks is an original free online bookmarks manager. With Quick Bookmarks you can access your bookmarks of your favourite sites anywhere you are: at home, at work, from any internet connection point. Sign up now by clicking the Sign Up button, make QB your personal start page and you can have it available from any computer! It's free! New user? Sign up and start to keep your bookmarks online now, it's free! Copyright © 2007-2013 QuickBookmarks.com. All rights reserved.